Mommy, Don’t Let Them Get You! How might God be speaking to you through these true stories from Iowa? I don’t know what to do. My husband died two weeks ago. I don’t have time to grieve. I’m too worried about taking care of my kids. The other day I was rear-ended, and my car is a mess. I am so lucky the policeman didn’t give me a ticket for not having a license. But he told me not to drive. Now he knows my car because of the dented fender, so how do I get to work? My kids are devastated from their father’s death and the trauma of living with a cancer patient for years. My husband was diagnosed when our youngest was two years old. Almost all of his life, our son has lived with the possibility of his father dying and also with the threat of both his parents being deported. It has traumatized him. I was at work the other day when someone ran into the office, saying, “ICE (Immigration and Customs Enforcement) is driving around in the neighborhood!” I was terrified. What would happen to my children if I’m deported? They are still grieving the death of their father, and now, what if I get deported? Every time I drive, I’m worried that I’ll be picked up. The other day I was driving from one place to another, and I know that ICE was following me. I saw them in my rearview mirror. What am I supposed to do? Stay behind locked doors in my house? How will I work? How will I buy food, make my house payment, pay the electric bill? I have been in Des Moines for twenty years. My husband had and I have no criminal record – nothing. Our daughter is a student at the university, and our son is in high school. If I’m sent back to the country in which I was born, what will happen to my son? Should he come with me? But then he would lose his educational opportunities. He’s a very good student. All I have are questions. No one has the answers. Lawyers can’t even tell me what’s going to happen because no one knows how the laws are going to be interpreted. People tell me, “Become legal.” How? There’s no way. I applied fifteen years ago, and I have at least five more years to wait to even be considered for permanent residency. The place where people worship in a church building is called the “sanctuary.” The concept of sanctuary or “safe places” for people to flee is found in Numbers 35:10-11, where God says to Moses, “When you cross the Jordan into the land of Canaan, then you shall select cities to be cities of refuge for you, so that a slayer who kills a person without intent may flee there.” The biblical practice of sanctuary was to protect an accused person from vigilante justice until a fair trial could be held. I love my children. They are the three most precious gifts from God that I can possibly imagine. And, my husband! He looks like a big hunk, but he is the sweetest guy you could ever meet. He knew from the very beginning of our relationship that I was undocumented. Since even before our first baby was born, he knew that I might be deported at any time. He knew he might end up being a single parent, so he decided to be the best dad he could possibly be … and he is! Since ICE has been out arresting people, I’ve been scared, really scared that his fear might become a reality, that he actually might be a single parent for our three children. The rumors on the street are crazy, just crazy. People say that our landlords will turn us in, that our enemies will turn us in, that we can’t talk to the police because they’ll turn us in. They say that ICE agents are horrible and mean. My husband was so worried that he made me quit my job. I am going crazy staying at home. I love my kids, but … we can’t go to the park anymore. We can’t go to the mall and have them play in the playground. We can’t go to the store to buy groceries together. We can’t walk in the neighborhood. I can’t work anymore. I can’t go to church. I can’t go to their school plays. It breaks my heart that they think I don’t want to attend their plays, but if I do go I might get caught and deported. I love them so much! I can’t imagine life if I were sent back to Central America! But it’s driving me crazy being in the house all of the time. My husband says that’s how it has to be for now. How long will “now” last? I’m Latino, born in California. Even though I’m a citizen, I don’t want to drive with my wife in the car because they will stop us and she doesn’t have documents. Why doesn’t she become legal? Why doesn’t she follow the correct way to come into the U.S., you ask? Well, the truth is, there is no way. So I have to convince my wife to stay at home so that she doesn’t get detained and sent away from us. I love her. I love her with all my being, yet I can’t do anything to protect her except make sure she stays at home and doesn’t answer the door except when she knows friends are coming over. I know it’s hard for her, but that’s how it has to be for now. In medieval England, from at least the 12th to the 16th centuries, sanctuary was a legal procedure in both the church and secular law. Once accused persons made it into the safety of a churchyard, a community was legally obligated to keep them safe and feed them for up to forty days. After forty days, fugitives often had to confess, give up their possessions, and walk barefoot to the nearest port where they would live in exile for the rest of their life. It is important to note that the concept of US faith communities providing sanctuary to undocumented immigrants has no legal standing, which means that housing an undocumented immigrant in a church building is a violation of federal law. 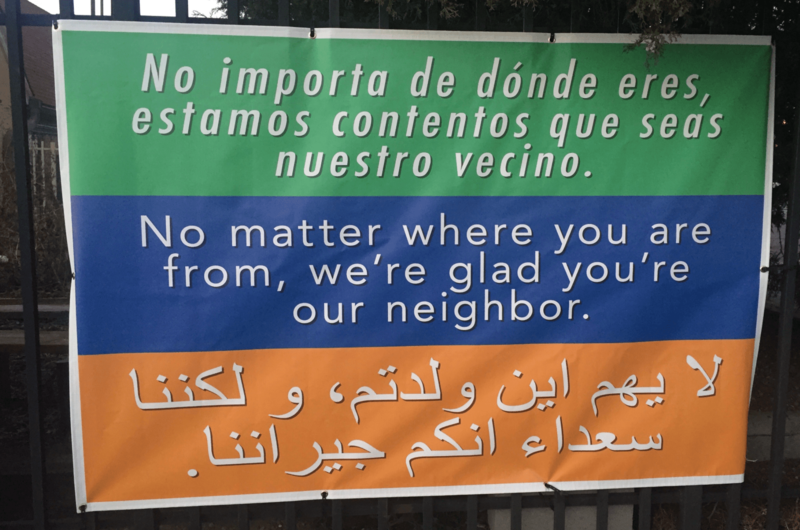 At the same time, there are currently faith communities housing immigrants across the US as a sign of God’s love, and historically, immigration enforcement agents have not entered houses of faith to remove a person. The new Executive Order has removed the previous administration’s practice of prioritizing the deportation of undocumented immigrants convicted of serious crimes. “Mommy don’t let them get you!” Those are the last words I hear from my five-year-old little girl every time I leave the house. I drive safely, I have insurance, I make sure the lights on my car are working properly, and I never go above the speed limit or run a red light or fail to stop at a stop sign… Yet I can’t stop being Latina. I can’t change the color of my skin or the way I look, so being stopped, arrested, and deported is always a possibility. I pray every day that I don’t get caught. I wonder why some people get caught and others don’t? Do some people pray more than others? Does God listen more to some than to others? What can we do to help our brothers and sisters who have made this country their home but live in constant terror? Dare we sacrifice the safety of others in order to ensure our own safety and comfort? Can we turn against our own neighbors? How do we preserve the dignity of others and work for the common good of all of God’s children? It was very upsetting to my mom. But I realized that I, too, looked like who I am, a Mexican. Well, I’m a U.S. citizen, and Des Moines is my home, but my family’s heritage is Mexican. Since then I have carried my U.S. passport everywhere I go. I am a professional. I have a Master’s degree and work at a university, but I walk in fear everywhere I go. It’s not just people who don’t have documents to work, it’s anyone who looks different from the stereotypical Iowans of European descent – white folks. When immigrants have to wait twenty years before even being considered for permanent residency, how can we be a voice for immigration reform? Support for those who are vulnerable can be given in different ways: through finances, meals, rides, child care, and prayer. Direct people to Justice for our Neighbors, a United Methodist free legal immigration ministry in many states, including Iowa. 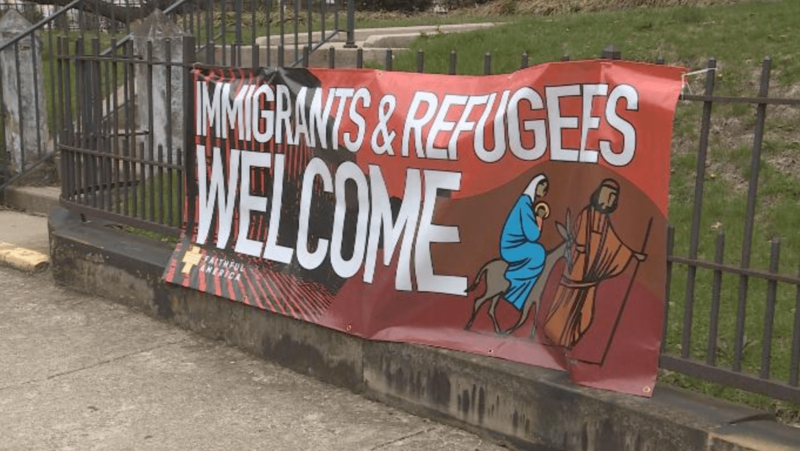 Churches can advertise their support for immigrant communities and welcome all people to worship and participate. I had tears in my eyes as I was reading this. No one should have to live in such fear! These are such touching stories. But – they are more than stories, they are realities for undocumented aliens. Supposedly ICE policies have changed but reading the above stories reminds me that families are still in danger of being split up. Greetings from JFON-SEMI. Thank you for this powerful message. Would it be OK if we share it with our supporters electronically (Facebook, enewsletter, website, etc.)? Hi, Victoria. You may use my blog in any way you wish. Thanks so much for all that you do to care for the most vulnerable among us. 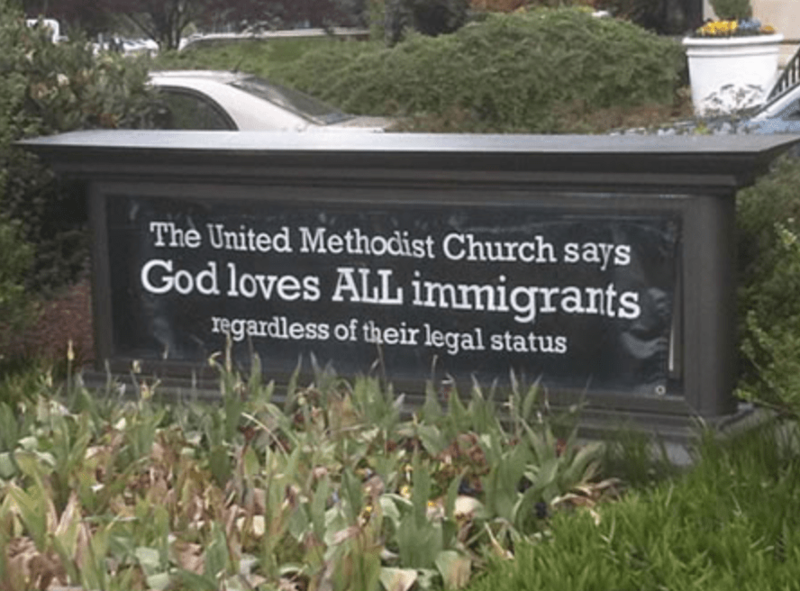 Why is the UMC becoming so political? Why is it that under this current POTUS we assume that ICE and the laws of this country are something new? When is it ok to knowingly break laws that have been on the books for decades? I am not selfish or a bigot but that is what people label us that disagree with the UMC. I do know that if I were to go and live in any other country I better find the legal and proper way otherwise I will be jailed or possibly worse . I talk to many Christian people they have the same views as I and the last election showed a strong majority in Iowa and the Midwest perhaps the UMC would be better off it they tone down the rhetoric. Does the UMC want to alienate roughly 60% or more of its members? As usual Laurie, you have not left any doubt what Christ would have us do. I had to read this in three different attempts because I was moved to tears and couldn’t see the words. Our refugee families have put real faces on this immigrant issue. Please never stop reminding us that we are the people of God, and we must never forget that we do not live in a vacuum. We cannot separate our faith from our political lives.